Getting a domain ( *.com , *.in, *.org ) is a dream of any bloggers and person who interested in web development. Here I am giving you a discount code for godaddy purchase. Here we are explaining how to apply this for domain purchase. 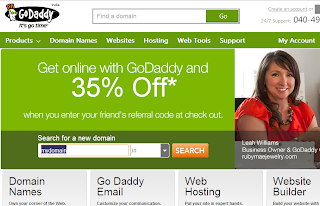 You will be redirected to Godaddy site in another page. Now Search for your domain availability. If your domain is available, Click on Continue Checkout, else search for another available name. Now there should be a 'Have Promo Code' text near the total amount. When click, a box will be appeared. type the promo code 'wow132013' in the promo code box. and click Apply. Now click Proceed to Checkout. you may be required to create Godaddy Account. And after that, do the purchase.